Aford Awards were asked to supply the Trophy to be awarded to the winning team tonight on the ‘The Full English’ on ITV, where the English Football legends take on a German legends team. The show airs tonight (19th March 2019) at 9pm on ITV. The English team have the likes of Harry Redknapp as manager and Paul Merson and Razor Ruddock as players. Aford Awards were asked to provide the football trophy prior to the final showdown which will be aired tonight. 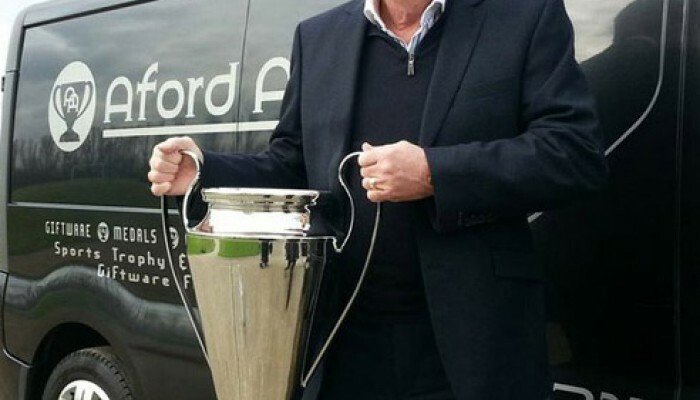 Jon Ford, Managing Director of Aford Awards delivered the huge trophy himself to Dartford Football Club where the team held some of their very interesting training sessions. The trophy in question is a huge 90cm silver cup, which stands on a large wooden base. The trophy was only taken on loan deal so is now back in our showroom in Maidstone, Kent.